WHAT IS HAPPENING AT CORROUR? 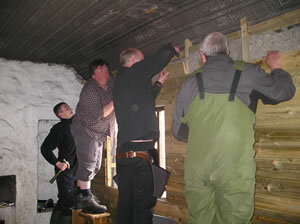 One of the oldest and arguably best known bothies in the country is currently undergoing a major restoration and refit. As part of the work being undertaken, Corrour will also soon boast the addition of a composting toilet. The Mountain Bothies Association (MBA) aim to improve facilities for visitors and address the long-standing concerns caused by pressure of numbers and irresponsible toilet practices. 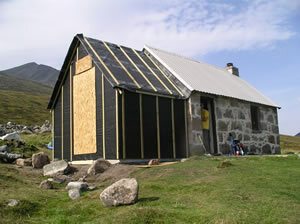 In a report prepared by Andrew Tait, planning officer (dated 11th August 2006) for the Cairngorms National Park Authority, the MBA proposal is described as a range of alterations including; a new door (for the existing doorway), window, internal porch, sleeping platform, wooden floor, and installation of a stove. It was noted that these works did not require planning permission and that most of the work had already been carried out. A small extension proposed at the southern end of the building to accommodate what is described as a dry toilet did, however, need planning permission. The extension is 2.6 meters in length and 3.6 meters is the full width of the building. The extension is designed with a pitched roof in corrugated material with vertical timber facings. Whilst it is described as a dry toilet there would be some level of liquid discharged that would go into a soak-away. With the aid of a grant from Scotland Unlimited, the MBA is to trial a new type of toilet system and will oversee the monitoring, maintenance and laboratory analysis of the composted waste. The toilet is designed using a system that involves two specially designed bags, one will be in use for the toilet where excess liquid will drain into a soak-away and the other, once full, will be essentially a sealed storage bag where remaining solid materials will further degrade. After a certain time when the material is deemed safe it will be dug into the ground at a point to be agreed between the MBA, CNPA, SNH, SEPA and NTS who own the property. It is expected that this pioneering and innovative work will work well and perhaps even provide a solution for other mountain areas where there is evidence of need for such facilities. Ultimately, it must be recognised that this proposal in principal has to be a significant improvement on the current situation and is likely to lead to an improvement in both ecological and human health terms. For further information a full report by John Cant of MBA can be found on NEMTs website showing this copy of Mountain Views. You are also invited to visit: www.mountainbothies.org.uk and www.compostloos.org.uk.